Lochgilphead stands, as the name suggests, at the head of Loch Gilp, a short loch leading north west from Loch Fyne. 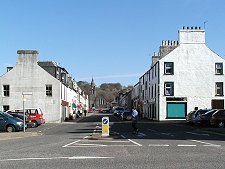 The town was first laid out as a planned settlement in about 1790, only a few years after the completion of the road from Inveraray to Campbeltown. Lochgilphead's position became still more important in 1801, with the opening of the Crinan Canal providing a short cut across the Kintyre peninsula. After passing down Lochgilphead's western side this meets Loch Fyne at Ardrishaig, two miles to the south. From 1819 Ardrishaig had a regular steamer connection to Glasgow, with an onward connection along the canal to Lochgilphead. In 1831 Lochgilphead acquired its own pier, and by then it had also been linked to Oban by road. 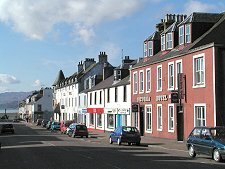 If Lochgilphead's early growth owed much to its location and its communication links, its later development had more to do with its role as administrative centre for Argyll. This has continued through various reorganisations of local government over the years. 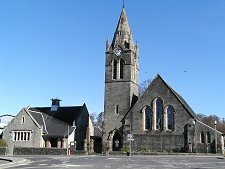 It now serves as the focus for the whole of Argyll and Bute, an area that extends east to Helensburgh, south beyond Campbeltown, north-east beyond Bridge of Orchy, and taking in many of the islands making up the Inner Hebrides including Islay and Mull. A truly vast swathe of western Scotland is administered from Lochgilphead. Lochgilphead's design is fairly straightforward and owes much to the grid on which it was originally built. The main A83 runs parallel to the north end of Loch Gilp, separated from it by a grassy parkland area. 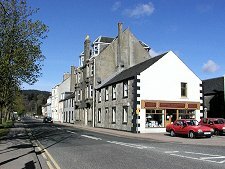 The main street then runs north from a roundabout on the A83, and Lochgilphead's shops and services are mostly found on this road or the roads running off both sides of it. 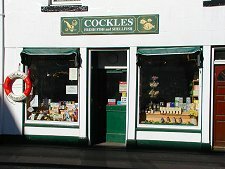 And this is a town whose shops are worth exploring. Too many shopping areas are cloned these days, full of standard issue chain stores that allow very little room for individuality and give very little hint of where you are. Not Lochgilphead. It's a little like stepping back in time, though carefully, as you walk around the brushes and dustbins on display outside the Dalriada DIY hardware shop. Nearly opposite, and equally invasive of the pavement, is the competition: Danny's Hardware, Pet Supplies and Garden Centre. A couple of doors the other way is Cockles Fresh Fish and Shellfish, complete with a lifebelt hanging up outside the shop. No, the cloned shopping centres have thankfully not reached this far and Lochgilphead is all the richer for it. 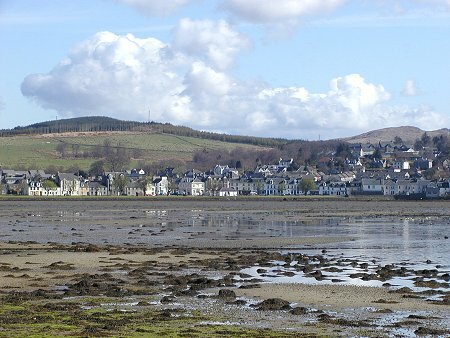 Beyond the town itself there is much to see and do around Lochgilphead. The Crinan Canal is well worth exploring, as is Crinan itself. To the north is the ancient capital of Dalriada at Dunadd, and beyond it the other archeological treasures of Kilmartin Glen. To the south and west lies the little known area of Knapdale, complete with its highly indented shoreline and little gems like Tayvallich.